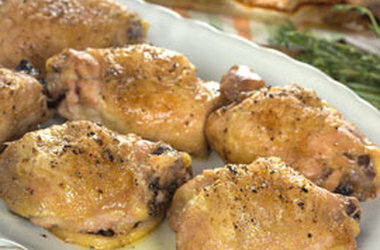 Keifer Derrin of food blog DonkeyFodder.com shares his quick and easy recipe for a simple lunchtime chicken dish. I was mooching around the house and was wondering what I could do for lunch. I was in the mood for some chicken thighs, (for me the best part of the chicken- much better than the breast as the meat has a lot more flavour and isn’t so dry). I was also checking what else I had; limes and some fresh sage leaves so put these together as well. This is a great lunchtime dish, which can be served with salad or some new potatoes. Put the olive oil and chopped sage into a bowl. Squeeze the juice of the lime into the bowl. (Hint – put the lime in a microwave for about 20 seconds to help release more juice). Shake some Tabasco into the bowl (depending on how hot you like it will depend on how much to shake in), then add the salt and pepper. Add the chicken to the bowl and stir all the ingredients together. If you have time let it marinate for a minimum of 30 minutes. Cook in the oven for 25-30 minutes (or until the chicken is cooked) and serve, pouring any juices over the meat. Tagged donkeyfodder. Bookmark the permalink.